We begin in the Automat. What better place to launch a column on William Blake’s birthday than with the first encounter between two of his most passionate advocates, Patti Smith and Allen Ginsberg? Smith’s endlessly readable 2010 memoir Just Kids offers only a few clues as to exactly where and when this chance meeting took place. Smith and Robert Mapplethorpe were living at the Chelsea Hotel at the time (I’m guessing late sixties); “a few doors down” was the Capitol Fishing tackle shop, a favorite source for two artists determined to transform “the insignificant into the divine.” According to Smith, “Horn and Hardart, the queen of Automats, was just past the tackle shop,” which puts the site in question at 202 West 23rd Street. Ginsberg not only adds the extra dime, he stands her to a cup of coffee, which, as any reader of M-Train knows, is elixir to Patti Smith. They sit down at a table, he talks about Walt Whitman, she mentions that she was raised near Camden, where Walt lived out his life and is buried. At this point, Ginsberg asks “Are you a girl?” Yes, she is, she says. “Is that a problem?” He laughs and admits that he took her for “a very pretty boy.” At which she offers to return the sandwich. No problem, “my mistake.” Years later after he becomes her “good friend and teacher,” he asks her how she would describe that first meeting. “I would say you fed me when I was hungry,” she tells him. I did a doubletake when I read that. She was talking about the Bush administration. Blake’s childhood vision was of “a tree filled with angels, bright angelic wings bespangling every bough like stars.” In an anecdote not unlike the American legend of Washington chopping down the cherry tree and confessing to his father “I cannot tell a lie,” Blake told his father what he’d seen and would have been thrashed for lying but for the intervention of his mother. He was “eight or ten” at the time. Two centuries later a William Blake Angel Oak was planted on Peckham Common in south London. Allen Ginsberg believed as much the day Blake spoke to him. It was June 1948 and he was subletting an apartment at 321 East 121st Street in Harlem. To paraphrase Patti Smith, “wherever it came from, whether he animated it from within,” the experience changed his life. A protracted account of what he calls “the apparitional voice” is in the aforementioned interview, reprinted in Writers at Work, the third series of Paris Review interviews. Ginsberg ends the anecdote by recalling that “a couple of girls were living next door and I crawled out on the fire escape and tapped on their window and said, ‘I’ve seen God!’ and they banged the window shut.” Ten years after the event, in Paris, he brings it to life in poetry: “I came home and found a lion in my living room/Rushed out on the fire escape screaming Lion! Lion!/Two stenographers pulled their brunette hair and banged the window shut.” When he tells his Reichian analyst, “There’s a lion in my living room,” the analyst that he actually consulted at the time says, “I’m afraid any discussion would have no value” and hangs up on him. We looked at each other and I wrote in “Blake” for Ben’s middle name. I wonder if I’m the only person who has been plagued by dreams of petty frustration over the past year and a half. I can’t say that these mundane going-nowhere so-what not-even-nightmares began after the 2016 election. But the overriding sense is that something’s wrong, an impediment needs to be cleared, a problem needs fixing, and I wake up relieved knowing that I needn’t worry about completing the trivial task, finding the house I was looking for, or the town, or the solution. Finally, last week I woke up smiling from a joyous dream, the storyline of no consequence save that it involved creating something beautiful. No loose ends, no massive impossible impediment to be cleared. 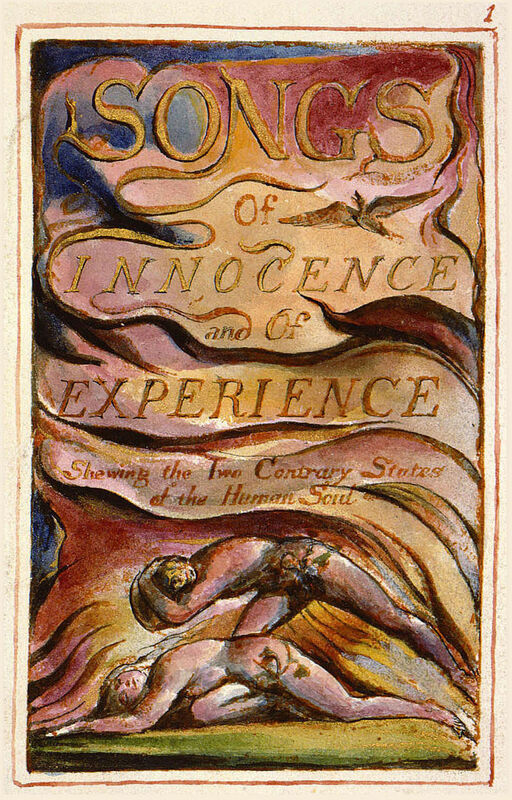 Looking toward the bedside table, I saw the copy of Songs of Innocence that I’d been reading the night before.